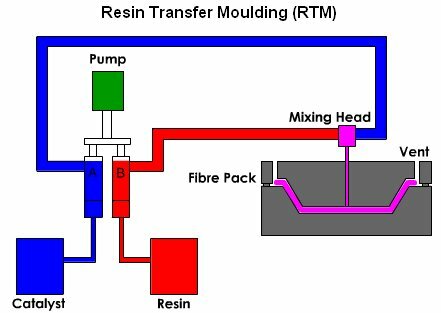 RTM is a low pressure moulding process, where a mixed resin and catalyst are injected into a closed mould containing a fibre pack or preform. When the resin has cured the mould can be opened and the finished component removed. A wide range of resin systems can be used including polyester, vinylester, epoxy, phenolic and methyl methacylates etc, combined with pigments and fillers including aluminium trihydrates and calcium carbonates if required. The fibre pack can be either, glass, carbon, arimid, or a combination of these. There are a large variety of weights and styles commonly available.